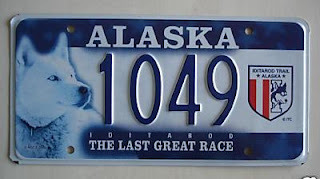 The Alaska bill to create Iditarod finisher license plates is back up for consideration as HB116. 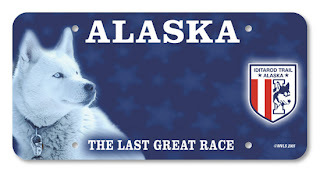 (y) Special request Iditarod race finisher plates. 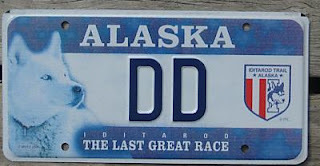 Upon application by the owner of a motor vehicle, the department may design and issue Iditarod race finisher registration plates to a person who has finished the Iditarod race. The owner shall supply written proof, verified by the Iditarod Trail Committee, that the owner has successfully finished the race. The department may disapprove the issuance of registration plates under this subsection when the requested plates are a duplication of an existing registration. The artwork may end up being different from the prototypes. This will be determined later in the approval process. The dog in this prototype is Fred Agree's dog, Blackie. If you could put any artwork or theme you wanted on you license plates, what would it be?